Packaging the beer is one of the most important parts of the brewing process. The individuals that work in the packaging department are charged with ensuring the beer we can, bottle or keg is of the highest quality and fits the needs of the consumer. The normal day starts with checking the carbonation level of the beer. After the carb level is to our standards, we then move onto sanitizing the necessary line, whether it is the can line, keg line, or bottling line. After the sanitation is done, we put the product into the proper container and ensure that there are no leaks or dents. Throughout the entire process, there are various quality checks that need to be done. This could be as simple as making sure the fill level of the container(s) is correct or could get as difficult as making sure the seams on the cans seal correctly and meet our standards. Once everything is said and done, the process then transfers to the warehouse department, where the wonderful Perrin product is sent out to you, the consumer. What are some variations we can see from the packaging crew? We package a lot of different products and use a lot of different vessels to do so. The consumer has seen us use 12oz, 22oz and 750ml bottles. The bottles have been wax dipped, crowned, cork and cage and bottle conditioned. We use preprinted cans and hand labeled cans (this is new for our canned sour series and other special beers). We have also done ‘one off’ kegs (sour, barrel aged, etc.) and firkins. Why is packaging viewed as the last defense in the brewing process? Our philosophy of ensuring a quality product starts with our procurement of raw materials and does not stop until the consumer drinks our product. 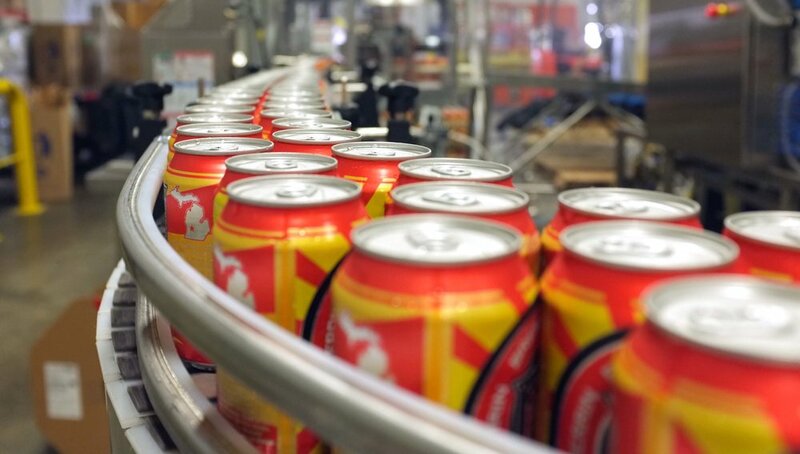 Our job in packaging is to ensure every individual unit (up to 24,000 cans and 300 kegs a day) is to the highest quality. It is packaging’s job to guarantee the highest quality product by running multiple QC checks, some in which can be very precise including seam checks on our cans that need to be within .003 inches, our carbonation levels need to be within .04 volumes. Now that we are expanding our market reach, many consumers first impression of Perrin Brewing Co. will come from one of our cans. So for our loyal consumers and our first timers, we work hard to guarantee it is an awesome recurring impression or first impression. Who are the guys on the crew? The packaging department is comprised of 9 people. The Packaging Manager Josh Stewart, 1st and 2nd Shift Leads Cody Dykstra and Josh Wilkinson, and 6 packaging wizards in Casey Conley, Jacob Cutler, Kurtis Lown, Grant Trisch, Drew Bond, and EÓin Klopcic. The following questions were answered by each of them. What is your favorite Perrin Beer? Why? Kurtis: Lil Griz! I can get that delicious bourbon barrel aged taste and have a few without getting obliterated. Jacob: No Rules. It tastes great, is sweet and I look forward to a different colored bowling ball every year! Casey: Grapefruit IPA. It is the perfect thirst quencher. Favorite song to sing karaoke to? Kurti: Ooooooo Uuuuuuuuh…… ummmmm I used to be a big Billy Idol guy but I would have to say that my new go to is Du Hast by Rammstein. Also, Maneater by Hall and Oates. Grant: Professional rappers or broccoli…..
Jacob: I don’t really do karaoke but my favorite song to sing is I Spy. What is your favorite part of the packaging process? Cody: Making the beer readily accessible to your mouth. Josh W: Kegging. It’s a great way to work out without going to the gym..